Japan’s NHK World TV will broadcast on June 25 a 3D scientific reportage on Vietnam’s Son Doong cave, which is classified as the largest cave in the world. NHK TV’s broadcast will reach 60 countries around the world, according to the Foreign Affairs Department of the central province of Quang Binh , where Son Doong cave was found. Department Deputy Director Nguyen Ngoc Quy said this scientific reportage is the first in the world using 3D technology. The reportage, called “Let’s fell the grandness of nature”, has been made by Japan’s Kyodo film studio with assistance of Quang Binh province and the British Cave Research Association (BCRA). Hang Son Doong (Mountain River Cave was announced as the largest in the world by BCRA, and selected as one of the most beautiful in the globe by the BBC news, according to Quy. 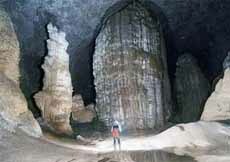 Son Doong cave was first spotted in Phong Nha-Ke Bang National Park by a local man named Ho Khanh in 1991. The cave was then made known publicly as lately as in 2009 by a group of British scientists from BCRA, led by Howard Limbert, after their surveying trip in Phong Nha-Ke Bang Park. According to Limbert, the cave is five times larger than the nearby Phong Nha cave, previously considered to be the largest cave in Vietnam. Son Doong cave is found to have a length of at least 6.5km. It is estimated to be 200m in width and 150m in height. The largest chamber of the cave is judged to be 250m in height. Scientists have also discovered a great number of stalactites in astonishingly extraordinary shapes and also primitive forests in the cave.